Fact: You are not stuck with only one kind of ostomy pouch! You should try several options to find the most suitable system for your lifestyle & personal needs. This guide below is to help educate you about available options so you can find the ideal pouching system. 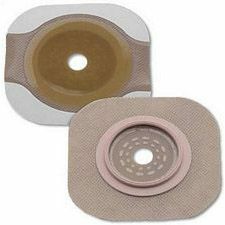 Nextra Health has hundreds of ostomy products from Hollister, Coloplast, ConvaTec and more. Skin Barrier - A flat panel of material that attaches to the skin and to the pouch. It has a hole in the middle sized to the measurements of the stoma. 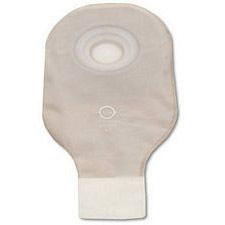 The skin barrier is placed around the stoma to protect it and adhere the pouch to the skin. Pouch - The actual plastic pouch used to collect stoma output. Pouches have a hole in the center-top where they fit around the stoma so all stoma output goes inside. There are many pouch styles; below we've outlined the big differences. Below we have outlined the most common options in pouch styles, followed with a list of more available options and accessories. 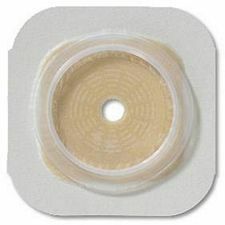 Transparent pouches made of see-through plastics are typically given to an ostomy patient after surgery so that a nurse can monitor the stoma and output. 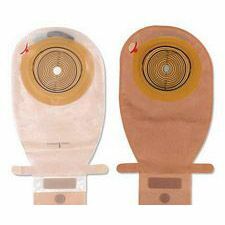 After leaving the hospital, once the stoma normalizes and output is predictable, many prefer the more discreet opaque (beige) pouches. A drainable pouch has an opening on the very bottom that is closed with either a clamp or an integrated closing system. A drainable pouch can be regularly emptied, greatly extending the wear time of the pouch. 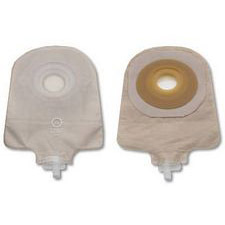 Drainable pouches are best for those with a colostomy or ileostomy. Hollister Lock n' Roll closures - Uses unique Microseal "bumps" that snap together to secure the pouch. In testing, every pouch with Microseal could withstand 40 lbs. of pressure without any leaks or breaks. 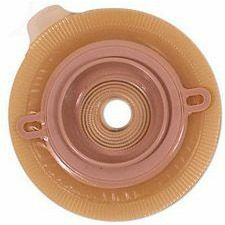 Coloplast Easiclose WIDE Outlet with Velcro - Features a wider opening that is faster to empty and easier to clean and a folding Velcro closure for easy opening and closing. A closed pouch has no opening; they are disposed when finished, making them a viable solution for those emptying a pouch no more than once or twice per day. 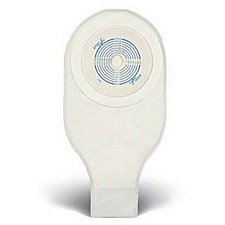 They are best for colostomy stomas and tend to have integrated filters for gas release. Swimming - Combined with a waterproof adhesive, the right closed pouch will fit comfortably under a swimsuit and still allow for swimming for both leisure or sport. Running - A closed pouch with strong adhesive will fit under the clothing comfortably and while resisting friction and movement that can compromise the barrier or pouch. Intimacy - A mini closed pouch provides discreet security without impeding movement or creating an obstacle. A one-piece ostomy pouch system has a skin barrier permanently attached to the pouch as a single unit. 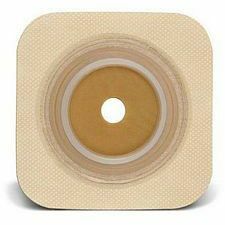 This makes application simple; simply peel the barrier like a sticker and attach it to the stoma. 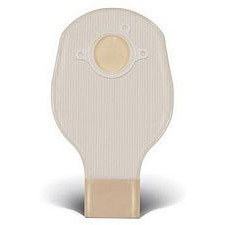 Hollister Karaya - A signature one-piece Hollister ostomy system designed for those with sensitivities to synthetic skin barriers and strong adhesives. 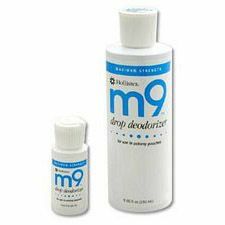 Made with natural Karaya rubber and use milder adhesives that many individuals prefer because it is easy on the skin. (Hollister recommends an ostomy belt or tape border for extra security.) For a more robust adhesive, consider the Hollister Premier One-Piece System. 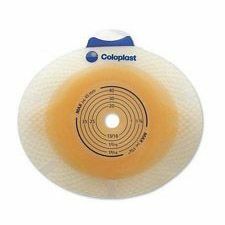 Coloplast Assura - Made of soft film that reduces odors, noise, and skin irritation. The pouches have two different adhesives applied in a spiral structure that provides both security from leaks and the skin-friendliness necessary for frequent pouch changes. 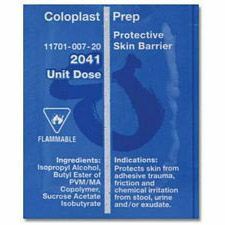 Also consider the Coloplast SenSura system with a strong protective adhesive layer and a second skin care layer. ConvaTec Activelife - A lightweight and flexible one-piece ostomy system with the popular Stomahesive and Durahesive skin barriers for comfort and convenience. Also features a comfort panel for noise and odor reduction. Two-piece pouching systems have a separate skin barrier and pouch. 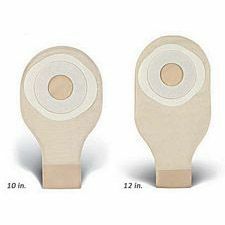 Two-piece skin barriers and pouches feature a plastic ring called a "flange" that snaps the two parts together. This makes the two-piece sstem more versatile since the pouch can be replaced without the need to change the skin barrier every time. This also gives you more flexibility for the type of skin barrier and pouch you choose to wear since any compatible barrier/pouch combo will work together. 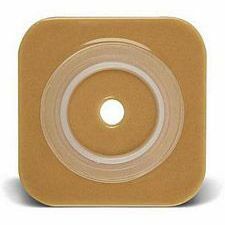 Hollister Floating Flange - A floating flange is a secure flange attached to the skin barrier allowing the wearer to put their fingers underneath the flange to attach the pouch. 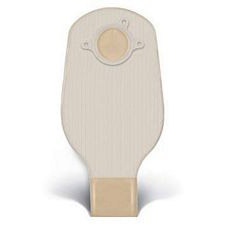 The advantage to doign this is that since the fingers can support the back end of the flange, only a very small amount of pressure is placed on the abdomen if it is tender and sore. 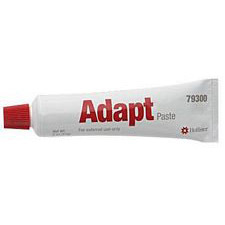 Convatec Adhesive Coupling Technology - A simple peel-and-stick method to securely connect a pouch to a skin barrier without the use of a plastic flange appliance. Convatec Autolock - Autolock flange systems secure with an audible click. When in place, the pouch can be rotated a full 360 degrees for repositioning without compromising the connection, easing the process of emptying the pouch. Coloplast SenSura Click - A click-lock coupling snaps into place for security yet still allows for easy removal with minimal pressure. 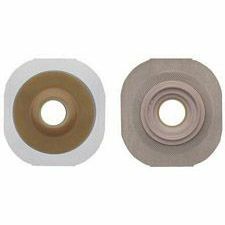 Pouch Filters - Some Ostomy pouches include an integrated filter, such as Hollister AF300 filters (pictured left) which require no filter cover and allows for continous venting without allowing liquids to penetrate from either inside or outside. 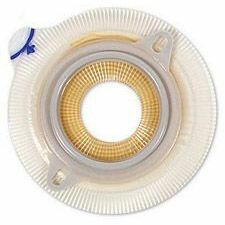 This makes it possible to safely use while bathing, swimming or during exercise and not risk leaking through the filter. Pouch Cloth Panels - On a warm day or under layers of clothing, skin becomes moist with perspiration. Wearing plastic pouches against the skin can become itchy or uncomfortable. Because of this, many pouches include a cloth panel on the skin side of the pouch, or a double-sized cloth panel for a more comfortable wear. The cloth panel can also add discreetness by helping to prevent plastic pouch "rustle" under the clothing. Integrated Pouch Closures - Drainable pouches traditionally folded over and closed with a plastic clamp. Some pouches, instead of this clamp, have an integrated closure for convenience and security. Examples: Hollister Microseal Closure, Coloplast integrated Velcro closure, and Convatec Invisiclose clipless tail closure system. 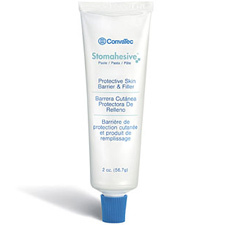 Skin Barrier Preparation Wipes and Sprays - All ostomy suppliers provide skin barrier protective wipes designed to give the skin extra protection for the peristomal skin.against the harshness of adhesives around the peristomal skin. 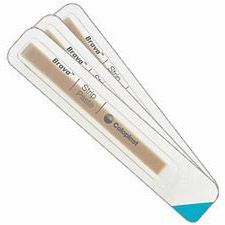 Popular products include Allkare Wipes from Convatec, Brava Skin Barrier Spray from Coloplast (pictured), and Hollister's Medical Ahesive Spray, which helps to increase skin barrier adhesion to the skin. Belt Tabs - Wearing a belt with an ostomy pouch helps provide extra stability and support to keep a pouch secure against the body. Some pouches include belt tabs to work with an ostomy belt. Belts can also help provide extra support for hernias, prolapsed stomas and bulges. Mold-to-Fit Barriers - A relatively new option available are mold-to-fit barriers. 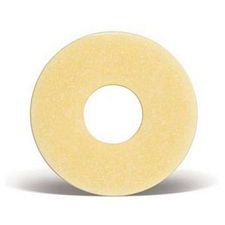 Instead of cutting a barrier to size, a mold-to-fit barrier is made out of a material that allows the wearer to conform the shape to the exact shape and size of the stoma. 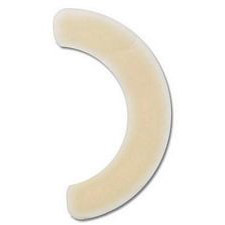 This is perfect for those with oblong stomas where the skin surround the stoma may not be as well protected with the usual circular cut on a skin barrier. 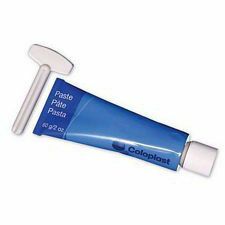 Coloplast® Ostomy Paste - 2 Oz.